A two-part bicycle Tune Up Class covers flat repair and common maintenance. 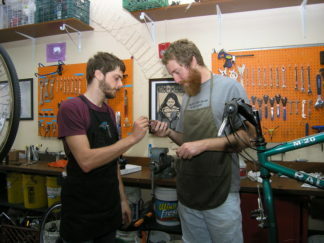 Our two-part bicycle Tune Up Class is taught by an experienced Recyclery crew mechanic. 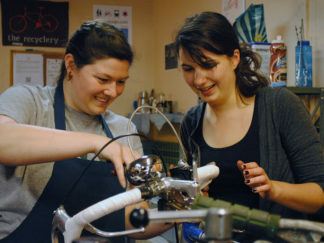 This class will introduce you to basic bicycle maintenance. 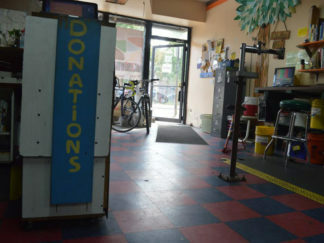 We will cover tool and component terminology, fixing a flat, chain maintenance, brake pad replacement, and basic shifting adjustments. These classes are generally held Sunday evenings, 6-9PM. Cost for the 2 session course is $75. Please bring your own bike to the class. We do not have storage, but we try to make sure it’s ridable by the end of each session. Geared bicycles are recommended over single speeds or fixed gears. We will provide hand-outs to help with learning.